Patch 5.1 brought extensive Pet Battle UI improvements to WoW. Now that the dust has settled, we thought we'd tell you about several new features and UI improvements that came to WarcraftPets this week. Pet Abilties, Here at Last! Topping our list of updates is the addition of a searchable pet ability database! Every wonder what abilities cause bleeding? Or which abilities are best in sunny weather? We've created a variety of powerful filters that allow you to discover pet abilities suited to your playstyle and battle team. Find all aquatic abilities with a DoT effect; find all damage spells that also reduce your opponent's accuracy—the sky's the limit! All pets listed on our site now show abilities underneath each pet's tooltip. Scroll over an ability to see what it does and what it's strong or weak against. Click an ability to bring up its profile, which provides a list of every pet that can use the ability. You'll also find a list of tags which show other abilities with similar effects when clicked. You can also browse abilities by family or scroll through our A-Z ability index. We've extended our search capabilities to cover abilities in addition to pets. Now when you search on a term, you'll get results with two tabs: Pets and Abilities. In days past when there were less than 200 pets, it was beneficial to allow searching by a pet's color or type. But with so many pets these days, simple searches for a pet by name would be flooded with results. So we've done a little clean-up to make your search results more relevant. First, we moved the tabs for General Info, Battle Info and Comments to the top of the page, making it easier to zero in on the info you're seeking. Second, we made some usability tweaks to the breed portion our Stat Calculator (found at the top of the "Battle Info" tab). It should now be much easier to discern one breed from another. We added a section called Breeds and Breed IDs to our popular Pet Battles Guide. So if you are struggling with the concept of breeds, this explanation should bring everything into focus. 5.1 gave pet collectors some new macro functionality for summoning pets. 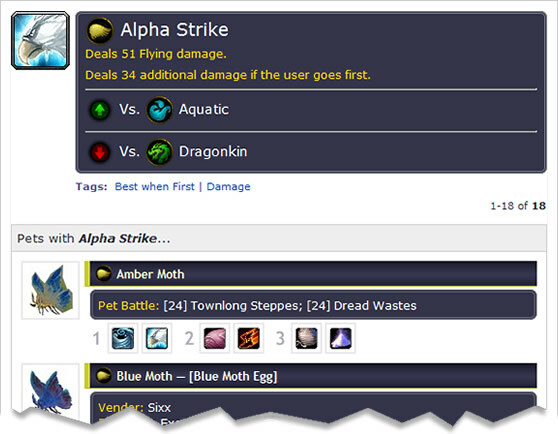 In addition, we did a little clean-up to our page of recommended pet addons. We've got even more treats coming in December! Soon you'll be able to track the quality, levels and stats of all of your collected pets. You'll also enjoy some additional collection stats, such as the percentage of rares you've collected, the average level of your pets, and more. A few of these stats will also work their way into our leaderboards. If there's a feature you've been itching to see here on WarcraftPets, drop us a line—your suggestions are what make this site the best resource around for pet collectors (and pet battlers)!